I was given these lamps by a very old friend and was wondering if anybody knew anything about Norman Rockwell Lamps? They have Norman Rockwell's "Man Leaving Work to Go Golfing" painting from the cover of the Saturday Evening Post on the front of them and the NR logo on top. They are in great condition. Does someone know what they might be worth? 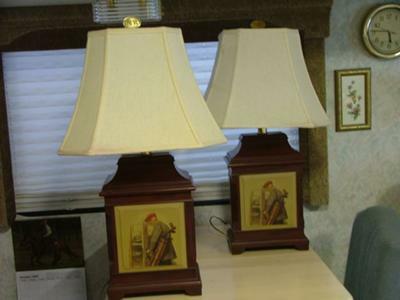 There are price stickers attached to the bottom of the lamps, Their original price was $379.00 apiece from whenever they were sold. Any information would be greatly appreciated!! I have more pictures if you need to see some close ups. I am sending a picture of a lamp with art work . Does anyone knows a collector who can give me estimate value? I have a Norman Rockwell lamp that is in the Tiffany style. Each pane of glass in the shade of the lamp has a different Norman Rockwell painting. Does anyone know anything about this? I own one of these lamps...purchased at a furniture store in the Northeast...I love it but know nothing about the history of NR and the lamps we own..
Join in and write your own page! It's easy to do. How? Simply click here to return to Man Leaving Work to Go Golfing.